As we all know, Jimmy Kimmel, an American late night television host had been very open on supporting the Filipino's pride 'Manny Pacquiao,' was happy 'cause he has able to join the entourage of the People's champ. Kimmel as we all notice wore a swagger like dressed somehow acting the way Justin Bieber is - a shirt sporting a Pacman figure about to eat small images of Mayweather's head, matched with a black sports jacket, gold chains and a fedora. As we remember, weeks before the fight, Kimmel personally requested to Pacquiao if he can join him on his entourage on the upcoming fight, just like Bieber on Mayweather's entourage. 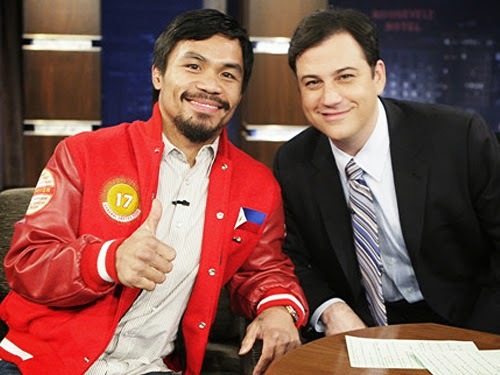 Kimmel on Pacquiao said, "I'll fight Justin Bieber. I don't care what has to happen." However, most of the people who watch the fight yesterday, May 3, 2015 local date were very disappointed on the result of the bout including the host himself. Jimmy Kimmel in his Twitter account said right after the judges announced the result, "Disappointing result but what a fight - thank you for making me your Bieber @MannyPacquiao - you are a champion." It may be true that Pacquiao loss that fight, but he won the heart and respect of many people all around the world. Comments or suggestions about "Jimmy Kimmel's message to Pacquiao after the battle of century" is important to us, you may share it by using the comment box below.